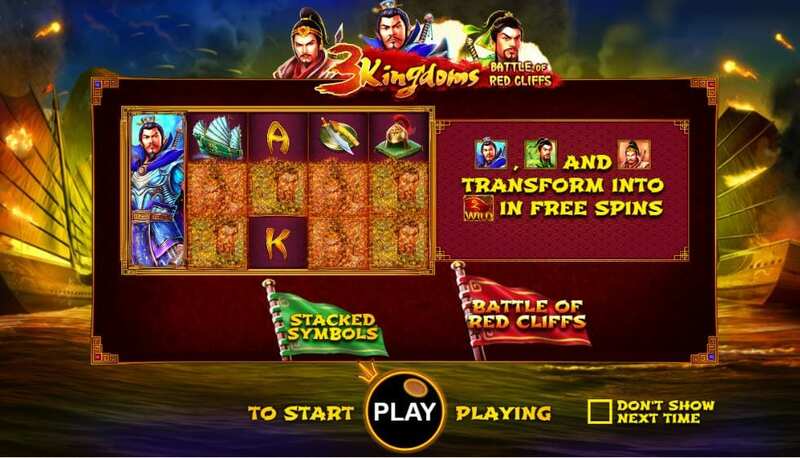 Join three fearless Chinese warriors, Cao Cao, Liu Bei and Sun Quan in their quest to gain supremacy of the kingdom in this one of the amazing slots online from Pragmatic Play. With bold graphics and bonus features, feel the might of Imperial China as you fight for victory. Pragmatic Play is a big name within the slot gaming industry and is only growing, ensuring each game they create is better than the last. Their focus is on creating games that are powerful, entertaining and unique. With over 80 slot games to their name, their mantra is on innovation and dedication. Some of their best-known games include Hot Safari, Queen of Gold and Pixie Wings. Follow the link for online slot games by Pragmatic Play! 3 Kingdoms Battle of Red Cliff is based on true events in ancient Chinese history. The three generals, Sun Quan, Liu Bei and Cao Cao were real warriors during the late Eastern Han dynasty. The Battle of Red Cliffs was a conflict that took place during the winter of AD 208/9. Pragmatic Play have taken a fascinating historical event and turned it into a modern and appealing game and something you can take part in. Players can take a look at our guide of best UK online slot games here. 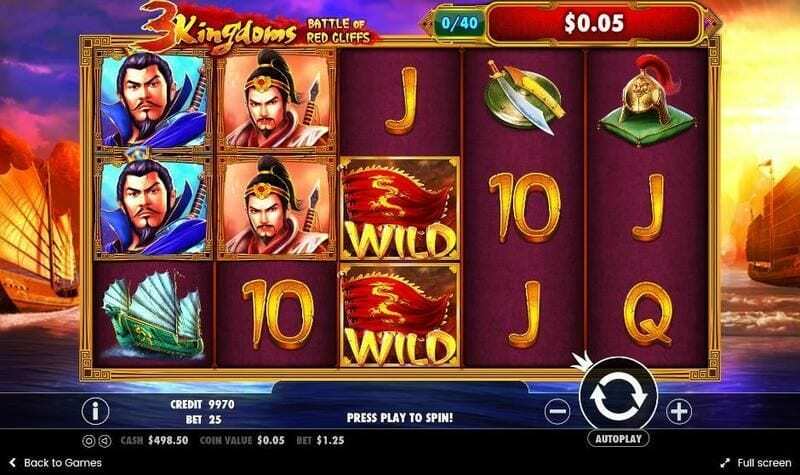 3 Kingdoms is a 5 reel, 25 payline game. You can place bets between 0.25p and £125. It can be played on any device. The music is traditionally Chinese, with a suitable mystic yet powerful tune. The colours are bold, bright and symbolise royalty, with purples, reds, blues and plenty of gold. The whole reel is set above an undulating ocean. The graphics are intricate and realistic. The higher paying symbols are the green, blue and red warriors who will award up to 200 coins. The lesser paying symbols include a sword on a shield, a ship with paper sails and calligraphy style letters. · WILD: - this is the flowing red banner with the Chinese dragon and will replace all other symbols in the game. · SCATTER – this is the Chinese temple. If it lands on reels 1,3 or 5, you will be taken to the Free Spins feature. · FREE SPINS – in this feature, there is the chance for a variety of free spins and a combination of wild symbols. In addition to the intriguing feature that will award 10 free spins, the vanity feature awards 20 free spins. Keep an eye on the red warrior as he will become a wild if he lands on reels 2-4. There is a total of 40 spins during the game. · PROGRESSIVE FEATURE – when you reach 40 points, this feature will be triggered. Take your pick from a selection of envelopes and you can win up to 100x your bet.